ZCM Services sells a full range of Sony monitors. Customers the world over have come to know and trust the name Sony. Years of pioneering research and development have resulted in ground breaking technologies, innovative products and remarkable commercial success. TrinitronTM technology is no exception. A Sony original, Trinitron has led the way in display systems and continues to set the standard for quality, performance and reliability. Since the first Trinitron display system was brought to market in 1968, over one hundred million have been sold worldwide - a true tribute to excellence. 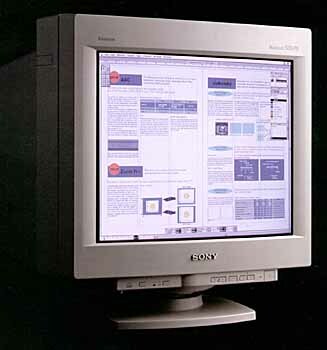 Trinitron tubes have a unique cylindrical profile whose horizontal curvature is so slight that the screen appears almost perfectly flat. In fact, many observers upon first seeing a Trinitron display say that straight lines are 'straighter than straight'. (an optical illusion of course, since the mind has been conditioned to the curvature of normal displays) Other advantages include the Dynamic Quadrapole Lens (DQL) system which ensures perfect screen focus from corner to corner and the Anti - Reflective (AR) coating which minimises screen reflections. Full compliance with American EPA power consumption standard, and the stringent Swedish Swedac MPR-II radiation standard guarantees a safe and energy efficient monitor. Platinum Series (PS) - the sharpest, high quality images for demanding professionals. Parameters such as the Earth's magnetic field are measured and compensated for, providing perfect convergence and colour purity at all times. Gold Series (GS) - combining high quality and performance. Ideal for the corporate professionals. Features include Graphic Picture enhancement mode and built - in self diagnostics. 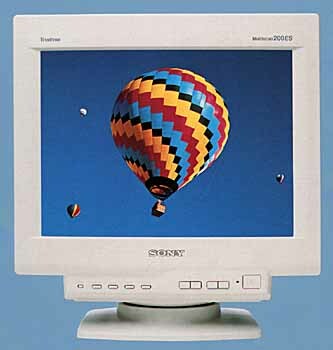 Elite Series (ES) - provide the quality and performance from the Trinitron system at an affordable price. Superior image focus provided by the DQL system. All models feature full digital control of all functions with on - screen display, AR coating and compatibility with Plug n Play PC and Apple Macintosh systems. All promotional photographs and advertising material, corporate names and logos, product names, trade names, trademarks and registered trademarks are the property of their respective owners, and are acknowledged as such. Whilst every care is taken in the preparation of the information presented in these pages, ZCM Services can take no responsibility for errors or omissions. Copyright ©1997 ZCM Services, Australia. Last updated on July 4, 2003.